Since at least the days of the Roman Empire, travertine has been a popular material for flooring. This porous limestone is beautiful and durable, which means that it can last a lifetime in a home or other building. However, there is one caveat: travertine must be cleaned properly to maintain its beauty and to prevent damage to the stone. Fortunately, it is not difficult to clean travertine. All it takes are the proper travertine cleaning products and a little bit of knowledge as to how to use them. Because travertine is porous, it must be cleaned with specially designed products to prevent scratching and staining. The stone is quite sensitive to acid, so acidic cleaning products and soaps should be avoided at all costs. Otherwise, the floor will end up looking dull. It is also important not to use ordinary liquid dishwashing soaps on travertine floors. While such soaps are insufficiently acidic to damage the stone, they will leave streaks or a film behind after the floor has dried. The best product for cleaning travertine floors is a granite or travertine cleaner that has a neutral pH, meaning that it is not acidic. These cleaners typically come in concentrate form, so they need to be diluted before they are used. Just follow the manufacturer’s directions on how to dilute the cleaner before it is applied to the floor. The most important products not to use for cleaning travertine include ammonia, vinegar, bathroom cleaners and cleaners made with orange or lemon products. All of these cleaners are highly acidic, and they have great potential to damage the floor. Before applying travertine cleaner to a travertine floor, the dirt, dust and other particulates on the floor must be removed. This is best done with a dry dust mop because it will prevent the movement of these particulates across the floor, thereby reducing the potential for scratching. Another good option is a canister or handheld vacuum cleaner that does not have to be dragged across the floor. The wheels on an upright vacuum cleaner can scratch the floor, so do not use that type of machine. After the particulate matter has been removed from the flooring, it is time to apply the aforementioned granite or travertine cleaner. After diluting the cleaner according to the manufacturer’s instructions, mop the travertine with a soft mop and the solution. Then, mop the floor using clean water in order to remove any solution that is left on the floor. How often the floor needs to be mopped will depend on the amount of traffic it receives. 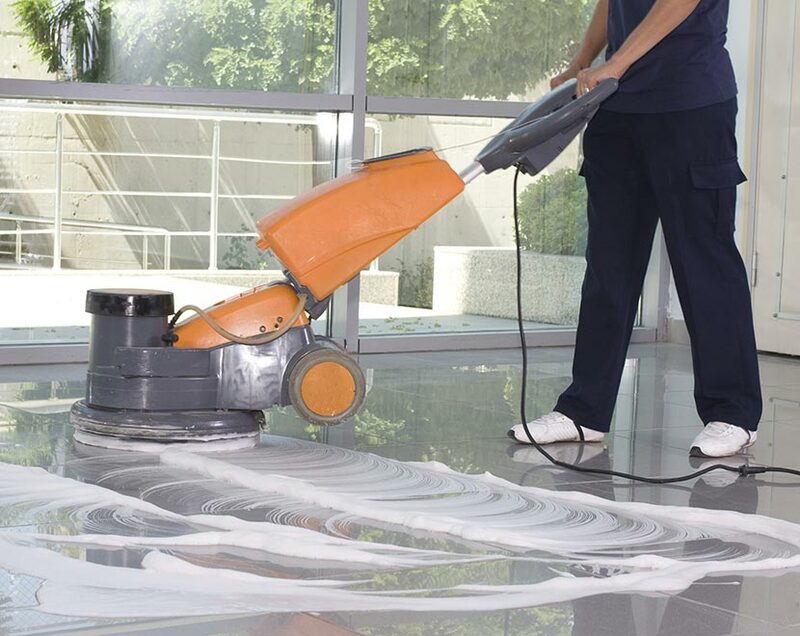 High-traffic floors in a public building will need to be mopped every day, while homeowners can usually get away with mopping only once a week or so. Due to the sensitivity of travertine to acidic products, any spills involving such things as wine, coffee, fruit juice, cleaning chemicals and so on should be addressed as soon as they happen. This is particularly important for polished travertine floors because that is where these acidic products will do the most noticeable damage. Blot up such spills right away, and then rinse with the travertine cleaner and clean water. In the long run, sealed travertine floors are easier to maintain and keep looking great than unsealed floors. Just as one should not use just any product to clean travertine floors, one cannot use generic sealers on travertine. Specially formulated travertine sealers will do the job right, and they will not damage the stone in the process. Many travertine sealers are also designed to seal other types of stone. Just make sure that the product is formulated for travertine if it can be used for other stone as well. Sealing travertine does not mean that spills can go unattended. Acidic products can still damage a sealed floor, although the sealant gives a little extra time between the time the acid is spilled and actual damage to the floor. The sealant will make the floor easier to clean, and it will reduce the damage and soiling that can be caused by people walking across the floor. What If the Travertine Gets Etched or Stained? Even those who pay the closest attention to the condition of their travertine floors may find that they get stained or scratched from time to time. Paint can typically be removed with a razor blade if only a small area has been covered, but paint strippers designed for travertine are necessary if the spill is large. Travertine stain removal products and even travertine cleaners such as those mentioned above will work well on most stains, including ink and oil-based stains. Just take care of the stains as soon as they are noticed. In the event of scratch marks or etchings, which are usually caused by acids, rub travertine polishing powder into the stone and then buff the area. Travertine floors can be a significant investment, so it is important to maintain them well. Clean and seal the stone properly, and the floors will look their best for many years to come.